Enjoy the unrivalled thrill of freefalling towards the ground from 10,000 feet up in the air with this adrenaline-pumping tandem skydiving experience. Receive a thorough safety briefing on skydiving and proper landing techniques before climbing into the plane and heading skywards. After being securely harnessed to a qualified instructor, get ready to step into the air! Having jumped from the plane, experience around 30 seconds of exhilarating freefall before the instructor opens the parachute and takes control. Then all that's left to do is enjoy the view and gently float back down to earth. For an additional cost on the day, buy a video of the jump to take home and show off to friends and family. Venues operate at least one weekend date and some on selected weekdays. The main season is from March to October. Please note that weekends are particularly busy and should be booked several weeks in advance. Maximum weight limits vary by venue, from 15 to 16 stone. Minimum age is 16. All jumpers are required to complete a health and safety form to confirm they are fit and able to jump. Jumping is always subject to weather conditions and cancellations for this reason are made with safety in mind. It is crucial to call the venue the morning of the jump to check on weather conditions. Duration is dependent on factors like the weather and the number of participants on the day. As a guide, training and jump take around an hour, but expect to be at the venue for much of the day. 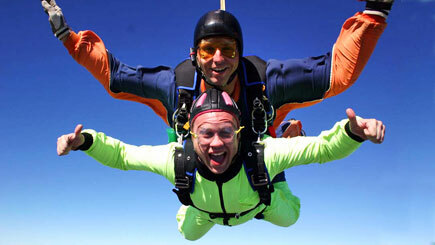 Training might be shared, the jump is one-to-one with a fully qualified skydiver. Dress warmly and comfortably, wear trainers and bring a sweater as it can get cold on the airfield. Most venues operate jumps on a first-come, first-served basis on the day. The chance to buy a video of the jump for an additional cost on the day is usually available.